Jesus teaches in the temple, but the chief priests and the scribes are there also, not willing that he should teach the people. ARLY IN THE morning Jesus and his disciples started away from Bethany to go again to the temple in Jerusalem. As they went, Jesus became hungry, and seeing a fig-tree by the roadside he stopped to eat of its fruit. But there were no figs on the tree, only leaves, and Jesus turned away disappointed. As he walked away he said, "Never again shall man eat fruit from this tree." 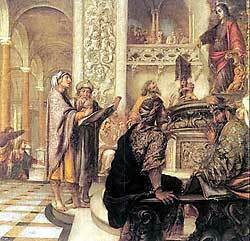 When Jesus came to the temple he saw men in there who were buying and selling animals for sacrifice-offerings, and others who were called money-changers. Once before he had driven such men out of the temple, and now he drove them out the second time, saying, "In the Scriptures it is written, 'My house shall be called a house of prayer'; but you have made it a den of thieves." For these men demanded more money for their sacrifice-offerings than they should have asked. The wave of excitement was still running high in the city, and every one was eager to see Jesus. The blind and the lame came to him in the temple, and he healed them there. And little children came singing, "Hosanna to the Son of David!" No doubt they had heard the glad songs of the grown people who had come with Jesus from the Mount of Olives, and they, too, wished to praise this great man, who took little ones in his arms and blessed them. The chief priests and scribes in the temple saw Jesus heal the blind and the lame, and they heard the children sing his praises. They were angered by these things, for they saw that every day the multitudes were becoming more excited about this Jesus. They came to him and asked, "Do you hear what these children are saying?" And in the Scriptures, 'Out of the mouths of little children thou has perfected praise?" In the evening Jesus returned again with his disciples to Bethany, to be with his dear friends, and in the morning he went back to teach the eager people who gathered early to hear him. As they passed along the road by the fig-tree that he had found only leaves on, the disciples saw that the tree had withered and now stood dry and dead. They were surprised that it should have changed so soon, and they spoke about it. Then Jesus taught them a lesson from the fig-tree. He said, "Have you faith in God. If you have faith to believe that God hears you when you pray you shall do greater things than I have done by my words to this fig-tree. For if you ask anything of God in prayer, and believe in your hearts that he hears you, the thing for which you ask shall be given." When they came to the temple many people had already gathered to hear Jesus teach. The chief priests and the scribes were there also, ready to ask him a question; for they were not willing that he should teach the people. They demanded of him, "By what authority do you teach and work miracles? Who gave you this authority?" Jesus knew how to answer them by asking a question of them. He said, "Was the baptism of John from heaven or of men? Tell me this and I will answer your question." Now the enemies of Jesus did not know how to answer. They had not received John's baptism as of God, and they feared to tell Jesus because many people were listening, and the people all claimed that surely John was a prophet of God. If they should not own John as a prophet they feared that the people would turn bitterly against them. Yet if they should say that John's baptism was of God they knew Jesus would ask why they had not believed him. So they said, "We can not tell whether John's baptism was from heaven or of men." Then Jesus answered, "Neither will I tell you by what authority I do these things, or who gave this authority to me." Again Jesus began to teach by story-sermons, called parables. He told them about a man who had two sons. This man called his elder son to him and said, "Son, go and work today in my vineyard." The boy answered his father roughly, saying, "I will not go!" But afterwards he became sorry, and repented of his unwillingness to obey his father's command. Then he went to the vineyard and worked. To the second son the father spoke the same words of command, and this boy replied politely, "I go, sir." But he did not. "Now," asked Jesus, "which of the two boys obeyed his father?" The people answered, "The first." Jesus said the two boys were like the two classes--the people whom the Pharisees and such called sinners, and the Pharisees and other leaders themselves. All these leaders claimed to be obedient, and yet they were not doing the things God had commanded, while the other people whom they called sinners had listened gladly to John's words and had been baptized by him. Another story which Jesus told was about a man who planted a vineyard, and built a hedge about it, digged a winepress in it, and built a watch-tower. Then he hired some men to care for it, and went away to another country. When the time came that the fruit of the vineyard should be ripened, he sent servants to get some of the fruit and bring it back to him. But the keepers of the vineyard treated the servants roughly. The first one who came they beat, and sent him away without any fruit. The second one they threw stones at and wounded him in the head. The third one they killed. Later other servants were sent; but the wicked keepers of the vineyard treated them all shamefully. The owner of the vineyard was very sad, and he decided at last to send his own son. "They will know he is my son," he reasoned, "and they will respect him." But when the keepers looked out from the watch-tower and saw the son coming, they said to each other, "The owner has sent his son. This vineyard will belong to him, because he is the heir, let us kill him, and take the vineyard for our own possession." So they caught him, and killed him, and threw his body outside the vineyard. "When the owner of that vineyard comes what will he do to those men?" asked Jesus. And the people answered, "He will cause them to be miserably destroyed, and he will give his vineyard into the care of better men who will give him some of its fruits. Then Jesus looked boldly upon his enemies standing near and said, "The kingdom of God shall be taken from you, and shall be given to another nation, which will bring forth fruit." The chief priests and scribes knew he had spoken the parables against them, and they were angry. But they were afraid to seize him because they knew all the people standing round believed that Jesus was a great prophet.